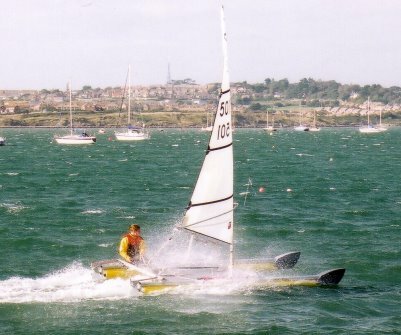 Catapult's development was honed at Weymouth speed week, catching opportunities provided by strong winds (dramatically shown below) using reduced rigs. 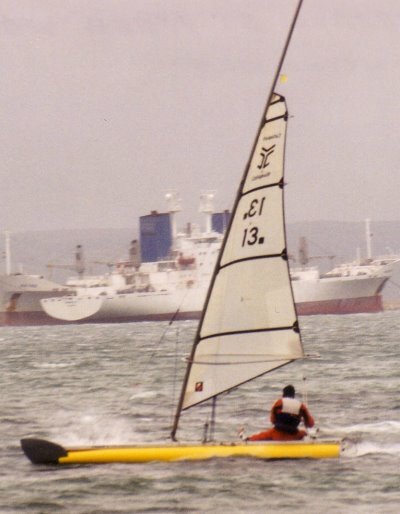 Catapult had a timed 500m run of 17.9 knots, with bursts over 20 knots, and helped shape the development of catamaran sailing in the UK. 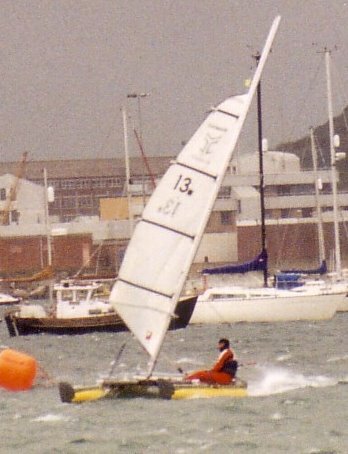 John Peperell (above) and Alex Montgomery (right) pound Weymouth Harbour. Alex is using a sleeve sail (6sqm) which Jon Montgomery developed in the early 90's wth a tapering sleeve to reduce sail twist. Slewing pushes the lee hull further forward to counter the pressure from the rig, and takes the weight of the windward hull (and helm) further back. 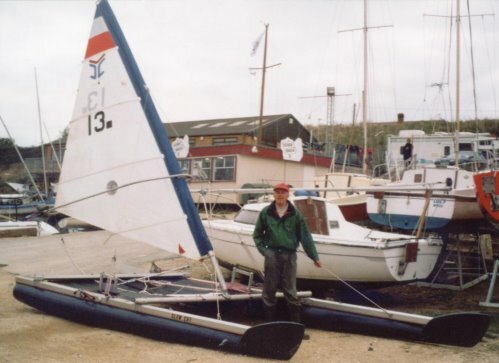 The boat is set up with the starboard hull slewed forward, for timed a run south to north in the prevailing SW wind at Weymouth -- by inverting the deck, the set up can be reversed, with port hull forward. 20 degrees was the largest slew tried---for the larger 5.5 boat, Jon Montgomery settled on 10 degrees. 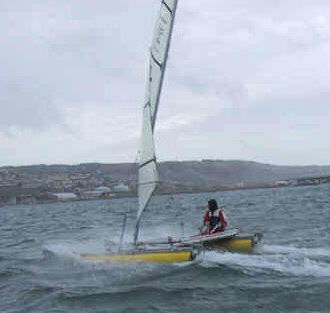 Below: Alex at speed again, sailing with a 7sqm Sobstad in an F6 NW. 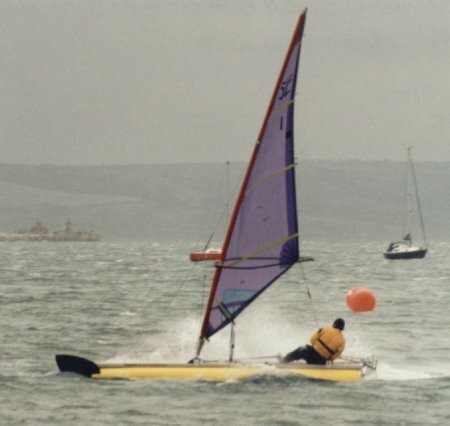 Above: John Peperell takes the principle that high speed comes from a small rig in a high wind to its limit. 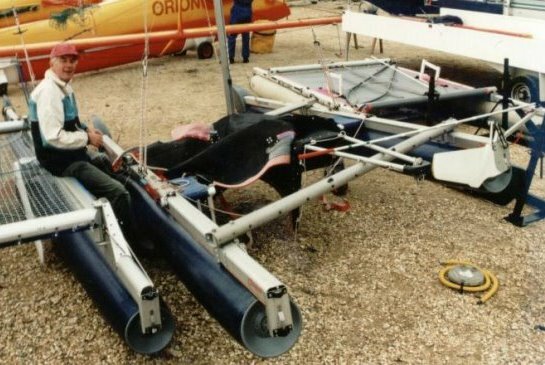 This early (mid 90's) Classic rig, about 5sqm, needed a 30+ knots south westerly to make it go.